In Hindu mythology, flowering Banyan trees are believed to grant your wishes. In Hindu mythology, it is believed that standing under a Banyan tree will grant your wishes and desires. 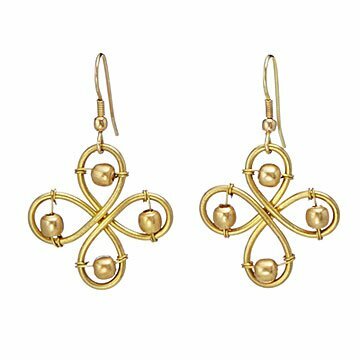 Wear a stunning portrayal of the majestic tree's flowers with these handmade brass earrings. Artisans in India craft the shimmering design by bending polished wires, and fastening circular beads to the petals. A beautiful gift for worldly friends or nature lovers, the piece gives ensembles a glowing touch. Handmade in India. 1.125" Dia, Total Drop 1.5"